A 500km touring route, highlighting hidden landmarks and much-loved countryside. 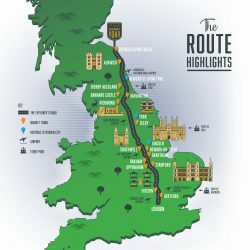 For two thousand years the English have travelled a highway which connects north to south, creating the original 500km multi-stop touring route through the historic and cultural heart of the nation. This is a new opportunity and invitation for visitors to get to know the English by exploring their traditions and eccentricities, the much-loved countryside, and the hidden landmarks known only to local people. From Hertford in the south, where Queen Elizabeth I spent most of her childhood, to the stunning castle and gardens at Alnwick, local stories, English icons and immersive experiences are waiting to be discovered along all or part of this captivating route. The Explorer’s Road would love to hear from you if you are interested in featuring the route in your programmes. Trade itineraries and APIs are currently in development and will be ready in early 2019, when sales missions will also commence. Training materials, branded route assets and hi-res images will also be available to those working in partnerships with The Explorer’s Road. Please contact Alex Jacobs in the first instance, to discuss your requirements. Do you have an experiential tourism product, attraction or tour along the Explorer’s Road? Or do you want to find out more about how you could get involved? The Explorer’s Road is working closely in partnership with destinations and suppliers along the route, so please contact Angela Tait to find out more.